Ontogeny has been identified as a main source of variation in the expression of plant phenotypes. However, there is limited information on the mechanisms behind the evolution of ontogenetic trajectories in plant defense. We explored if risk of attack, herbivore damage, heritability, and phenotypic plasticity can promote or constrain the evolutionary potential of ontogenetic trajectories in three defensive traits. We exposed 20 genotypes of Turnera velutina to contrasting environments (shadehouse and field plots), and measured the cyanogenic potential, trichome density, and sugar content in extrafloral nectar in seedlings, juveniles and reproductive plants. We also assessed risk of attack through oviposition preferences, and quantified herbivore damage in the field. We estimated genetic variance, broad sense heritability, and evolvability of the defensive traits at each ontogenetic stage, and of the ontogenetic trajectories themselves. For plants growing in the shadehouse, we found genetic variation and broad sense heritability for cyanogenic potential in seedlings, and for trichome density at all ontogenetic stages. Genetic variation and heritability of ontogenetic trajectories was detected for trichome density only. These genetic pre-requisites for evolution, however, were not detected in the field, suggesting that environmental variation and phenotypic plastic responses mask any heritable variation. Finally, ontogenetic trajectories were found to be plastic, differing between shadehouse and field conditions for the same genetic families. Overall, we provide support for the idea that changes in herbivore pressure can be a mechanism behind the evolution of ontogenetic trajectories. This evolutionary potential, however, can be constrained by phenotypic plasticity expressed in heterogeneous environments. Communicated by Colin Mark Orians. The online version of this article ( https://doi.org/10.1007/s00442-018-4077-7) contains supplementary material, which is available to authorized users. We thank Ruben Perez Ishiwara for his assistance in fieldwork and laboratory assays. We also thank X. Damian, P. Zedillo, N. Villamil, L. Ochoa, L. López, G. García, C. Peralta, A. Bernal, J. Aguilar, I. Lemus, I. Lemus, M. Castañeda, S. Soria, C. Manriquez, B. Ramírez, M. Maldonado, M. Ramirez, F. Ayhllon, A. López, I. Gongora, S. Salazar, J. Campuzano, and B. Esquivel for their invaluable help in the field and shadehouse, and all CICOLMA staff members for all the assistance in the facilities. Funding was provided to KB by PAPIIT-UNAM (IN-211314). 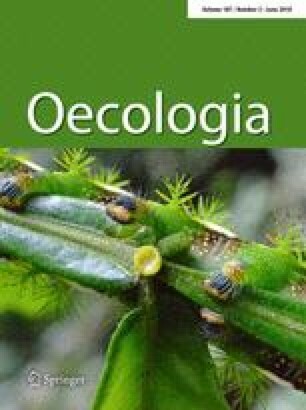 SO acknowledges CONACyT and the graduate program Posgrado en Ciencias Biológicas at the Universidad Nacional Autónoma de México for the academic and financial support. SO, KB and JF conceived and designed the experiments. SO conducted the fieldwork and performed the statistical analyses. RR performed the oviposition preference experiments. SO, KEB, KB and JF wrote the manuscript.